Alden Ehrenreich plays a young Han Solo. For all the unforgivable sins of the much-lamented Star Wars prequels, give George Lucas credit for one thing: He never screwed with Han Solo. At no point in Episodes I through III did we see a smudge-faced street urchin version of Han running petty scams with his Chewbacca puppy, and thus while The Force turned into midichlorians, the legendary smuggler's cocky yet bumbling cool remained canon. The current Star Wars shepherds at Disney, on the other hand, could care less what legacies they tarnish, just so long as they get a steady of stream of theme park-ready product, so now Ron Howard's Solo: A Star Wars Story exists in the world. With it goes my one last reason to care about further Star Wars movies as anything other than a conveyer belt of the most pandering, performative woke-ness possible. 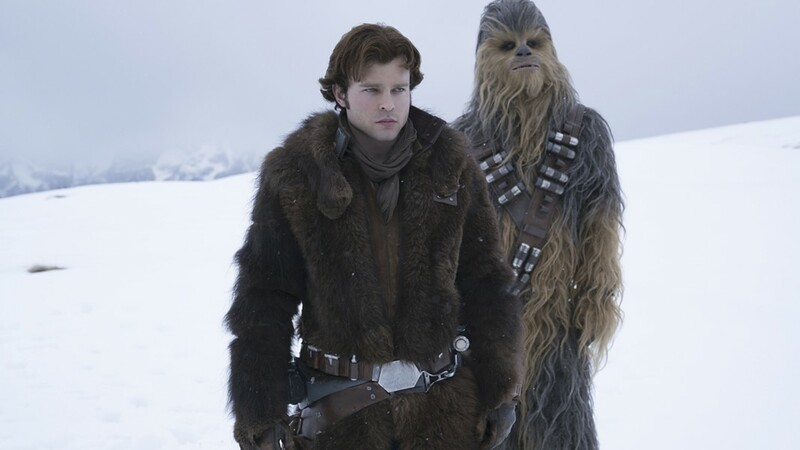 Ironically, Solo, which pointlessly fills in the blanks of the early life of the rogue hero, comes as close as any of the new live-action Star Wars movies to capturing the clattering dutifulness and eye-stabbing imagery of the prequels. Rejoice, people who don't care about the quality of the media they ingest just so long as they recognize the brand! There's even a culturally insensitive, Jar Jar-esque space monkey for the kids, as well as a nonsensical cameo from a key player in The Phantom Menace. Solo is essentially a 135-minute version of the River Phoenix sequence from Indiana Jones and the Last Crusade — only it looks like complete garbage and is no fun at all. It's a nonstop succession of callbacks, wink-wink foreshadowing, and Infinity Stone-style worldbuilding meant to explain the origin of everything Han Solo ever did, said, or touched over the course of Episodes IV through VI. Worse, Solo is shot like an early 1990s primetime drama, all gauzy lighting, shadowy interiors, and monochromatic colors. Original Solo directors Phil Lord and Christopher Miller were booted from the project well into production and were replaced by career hack Ron Howard, who never met a property he couldn't drain of personality (Howard apparently re-shot roughly 70 percent of Lord and Miller's work). As ever, Howard's concept of visual cinema is hopelessly flat and punishingly literal. Call it old-school Hollywood craftsmanship if you insist, but I wouldn't trust the guy to build a stairway to nowhere. Alden Ehrenreich stole scenes as Hobie Doyle in Hail, Caesar!, but he is given a largely thankless task in Solo. When his performance works, it's because he reminds us of our affection for the character that Ford created; when it doesn't work, which is often, Ehrenreich looks like a bad cosplayer. Ehrenreich and co-star Donald Glover, sleepwalking through a bad impression of Billy Dee Williams as Lando Calrissian, both look like poorly molded Muppet Babies versions of their predecessors. Of course, the failings of Solo span well beyond the casting and concept. Lawrence Kasdan and Jon Kasdan contributed a tin-eared and overstuffed script that renders any attempt to build suspense or create a sense of mystery futile, as it becomes clear early on that every semi-mysterious character will inevitably remove their mask and start monologuing about their origin story.